The thing I find about diet regimes and loosing weight (not just me but friends and family) is that are short-termism. One generally binge-diets, goes back to their usual ways and then goes back on another fad diet. My Daily Detox is no exception. I know I can’t sustain it but I’m trying to change my lifestyle and habits just a little bit. In the long run I do hope to change some habits – for example cutting down on my sugar intake, drinking more water but also having a large lunch and a smaller dinner (it has always been the opposite). It makes sense: I can burn off the larger lunch but a large dinner sits on my middle during a relatively inactive sleep. So my trial on losing a bit of weight and being healthier is not about cutting out things completely. Absence makes the heart grow fonder. Years ago I cut out chocolate, cake and biscuit completely for one month, and on the first day “off” I gobbled a whole box of Fingers in one go. What was the point in that?! By cutting out the things you like is no fun – you only live once – so I am having a few treats. I summarise that in the last three weeks I have probably eaten about 20-25% of what I usually eat sugar-wise. That is to be celebrated – more cake please!! Pizza, croissant, cake: as long as I am conscious, sensible and responsible it’s ok to have these things in moderation. Dieting is not about abstinence, it is about making better choices. Today’s soup is quite ambitious by my standards. I was looking for a different vegetable to use when I was browsing the supermarket shelf and saw an aubergine. Intrigued, I did a quick search for soups with aubergine in and came across this recipe. It seemed pretty simple, just an age to make. Perfect for a lazy Saturday! 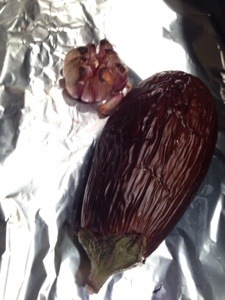 Once the garlic and aubergine had been roasted, the recipe said to peel them both. The skin came off like a dream! Really easy! 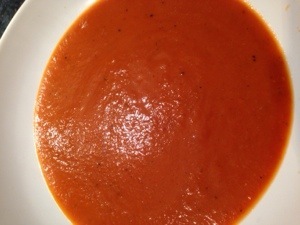 Then it was the usual onions and stock, with some tomato purée and, 40 minutes later a great smelling soup. We don’t have half-and-half in the UK so some whole milk did the trick to add a bit if cream. And it was delicious! The garlic was so subtle it was perfect. Definitely trying this one again! If you have a soup I can try, tweet me @jelly_wobbler.